We are a full service cabinet shop with over 20 years of experience including kitchen, bath, office, fireplace, and entertainment centers. Homan Interiors began in 1994, launched by John and Jean Homan as a long-planned dream realized. Over the years we have added success stories and skillsets, along with three sons to the business, to where we stand right now. Our shop is located just outside of New Bremen, Ohio where we continue to grow and move forward with the industry while servicing the Auglaize, Mercer, Darke, and Shelby Counties. From cabinet design work to countertops, Homan Interiors is ready to partner with you on your home renovation or new build projects. Our design team loves designing beautiful, yet cost effective projects-all designed to your taste and budget! From basic to elaborate, we have the style and design to fit your needs. We work with our customers to not only meet, but exceed their expectations. 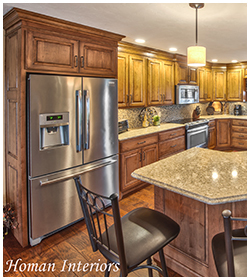 Here at Homan Interiors, we know that the kitchen is the heart of the home. This is where friends and family come together to share stories while also sharing meals. As such, shouldn’t the kitchen be comfortable, beautiful and functional -- a focal point of the home that you can be proud of? We think so, and that's why we take time to analyze each living situation individually to reimagine a perfect solution that is as unique as the family and friends who share that kitchen space. Using decades of interior design experience, our team will collaborate with you, offering thoughtful suggestions that will help produce the perfect kitchen that we will each be proud of. Cabinets are one of the biggest expenses when building or remodeling a home. That's why we understand how important it is to get this element correct from the start of your project. At Homan Interiors, we design to your budget! Full service custom cabinet shop since 1994. Experience includes kitchen, bath, office, fireplace, and entertainment centers. Team of experienced workers to build and install your cabinets. Our team takes pride in their work and with their attention to detail. Your dreams and expectations will become a reality. Full time designer on staff to help you coordinate your project from beginning to end. Newly designed showroom where customers can view not only wood species and finishes, but moldings and countertops as well.